After 17 years I still find “new” things in our collection. In our archives we have several bookshelves of large ledgers that were used by businesses and organizations. Most have cloth covers but two are leather-bound with gold lettering on the spine. The name on the spine caught my attention, then I opened the book to the first page. The name was accurate for the time but misleading to today’s reader. The modern Geneva General Hospital, under the name Geneva City Hospital, didn’t open until 1898. 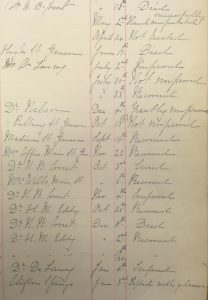 This was the ledger for the Church Home Hospital. Original Church Home on Pulteney Street, razed to build DeSales High School. 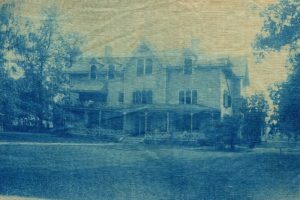 Fun fact: blue photographs are cyanotypes, or photographic blueprints. In 1878 the Episcopal Church incorporated The Church Home on the Foster Swift Foundation. It provided care for the elderly with no family who could care for them. The modern equivalent would be a nursing home, including a stipulation that any property must be signed over to the Home. Treatment records were fairly simple. The Result column ranged from Died to Recovered with variations of Improved – Not, Somewhat, and Greatly. Many patients had complications of common diseases while some were there for occupational injuries. Railroad brakemen often came in with broken or crushed appendages, some which required amputation. They operated each train car’s brakes from the top of the car, and worked between cars linking them together. Machinists were admitted with facial injuries, often a piece of metal embedded in an eye. Treatment – Treatment records were fairly simple. The Result column ranged from Died to Recovered with variations of Improved – Not, Somewhat, and Greatly. By 1892 the Church Hospital was not adequate for Geneva’s growing population. People were turned away for lack of beds and at least one surgery was done under a tent on the lawn. In that year the new Medical & Surgical Hospital of Geneva was incorporated (the name was soon changed to Geneva City Hospital). Trustees began fundraising but, like many projects, the hospital took longer than expected to open. Patients treated in hospital, four; patients refused admission, not any; visits made to patients in [the Episcopal] parish, 19; visits made to patients in Church Home, 97. During the year Dr. Stebbins (the home physician), Dr. DeLaney and Dr. Eddy have kindly given their services. Very informative. I knew about the Church Home but not that it served as a Hospital.